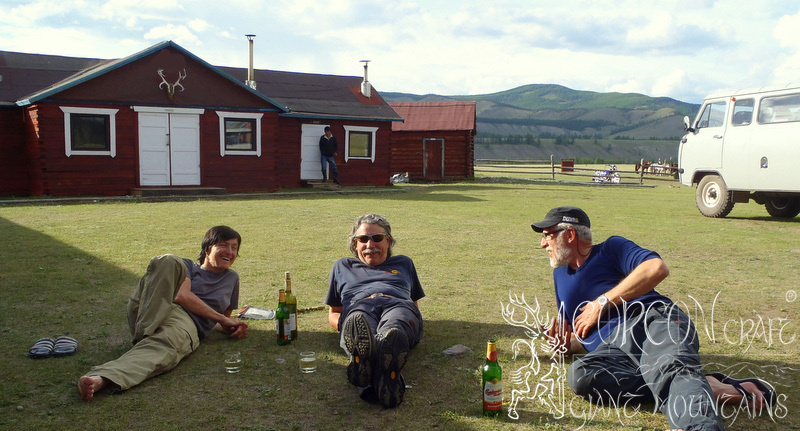 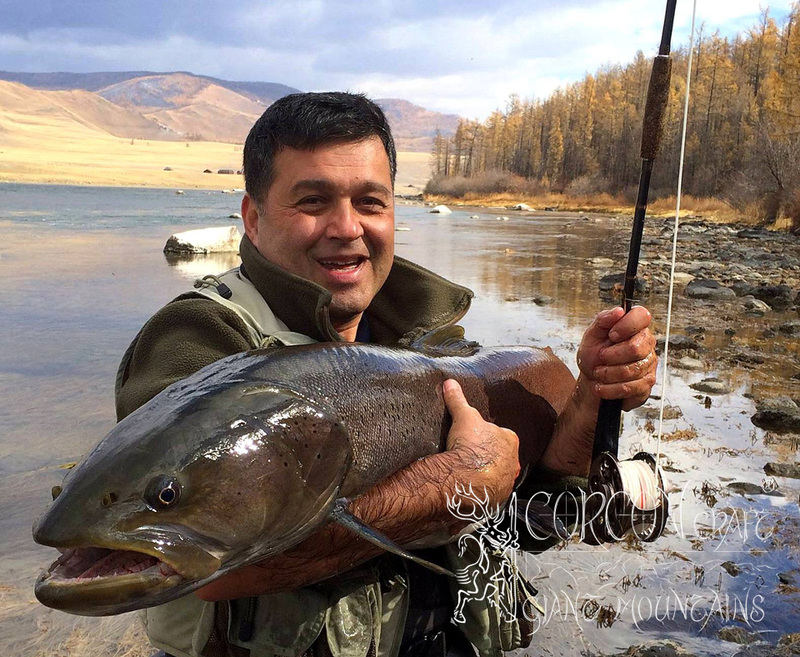 In the vast highlands of the Mongolian / Siberian Borders in the North-West, at a truly magical place, where the legendary Taimen rivers Shishkid and Tengis flow together, one of our first and most productive fishings camps has been erected many years ago. 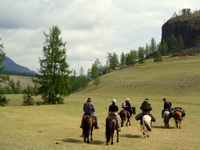 Camp Tengis has been built from solid log-cabins and is situated at the last outpost of the Darhat Basin, where the green rolling hills of the vast Mongolian Steppe meet the woodland Taiga of the Eastern Sayan Mountains, a wild and unaccessable mountain range with peaks of 13.500 ft., which are almost always covered with snow. 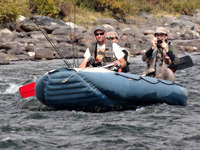 The fishing camp is fully equipped with off-road vehicle, horses, rafts, tents and camping gear for day trips and extended fishing tours along the rivers. 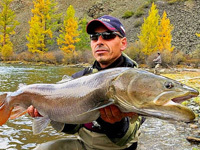 The river Shargin in the vast Darhat Basin can be also reached by day trips and accounts every year for large Taimen specimen for our fishing guests. 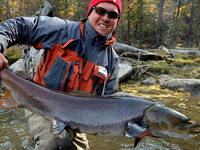 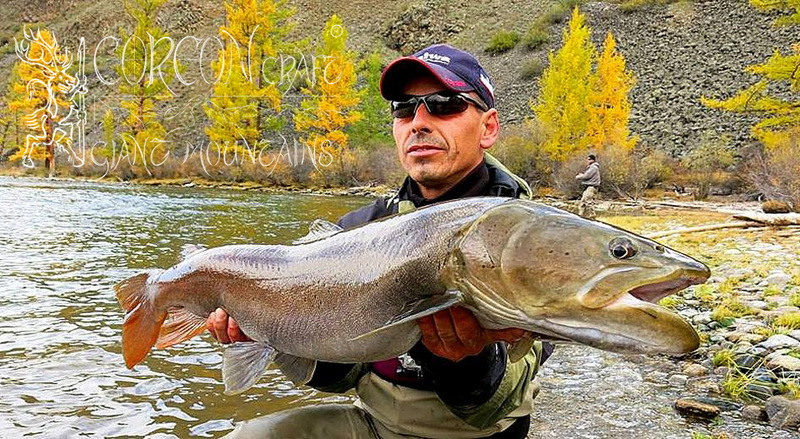 No less than 3 legendary Taimen rivers await the travelling sportsman and avid fly-fisher, with more than 70 miles of productive river stretches for some extraordinary and many-sided fishing. 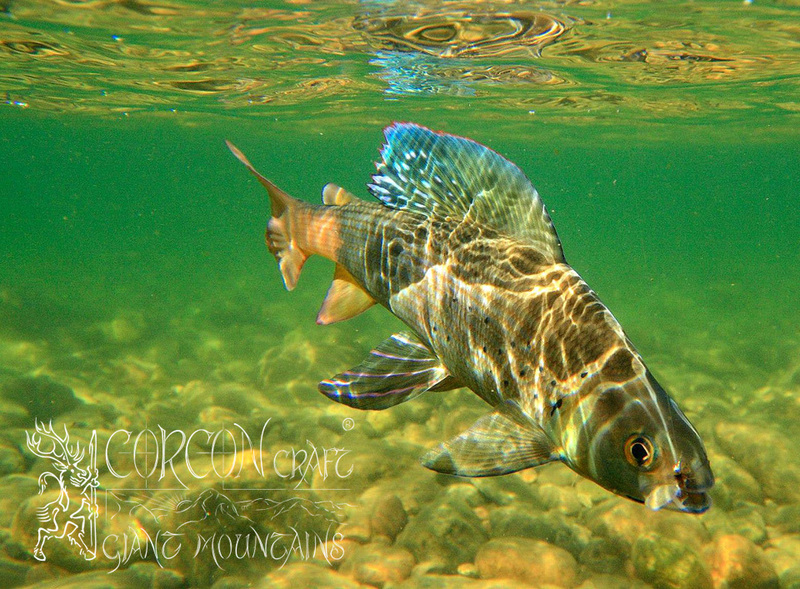 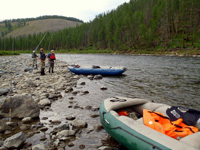 The rivers are medium sized mountain rivers with a strong current, stony river beds with crystal clear water, and with many tall rocks and countless boulders, crooks, islands, and side arms, - forming deep Taimen pools and a rich, diverse environment for big and plentiful fish. 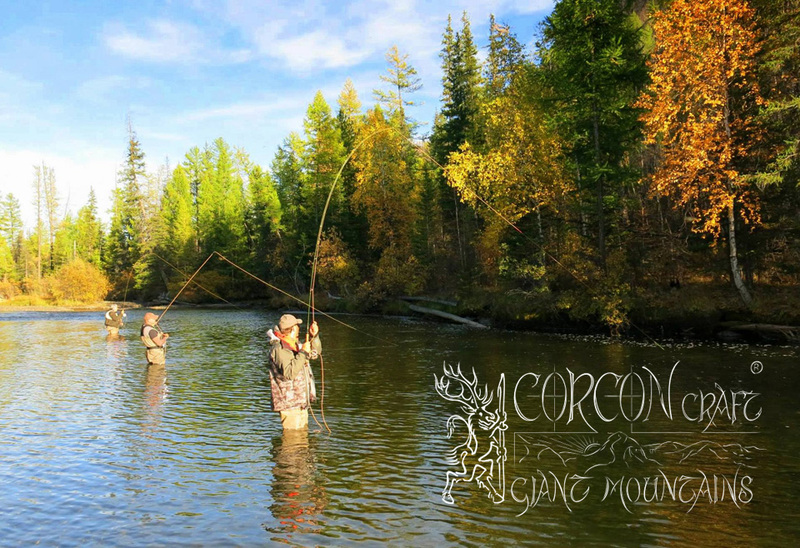 Our fishing is performed from the bank and by wading, and rafts and horses are used only to reach remote pools and river beats. 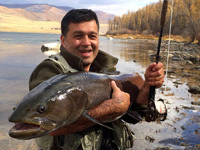 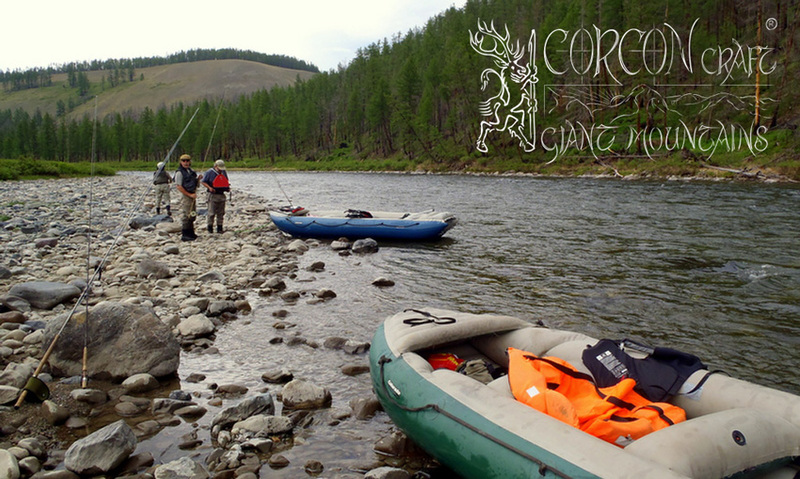 New for the 2015 fishing season is our river expedition up the pristine Tengis and into the wild of the rugged Sayan Mountains. 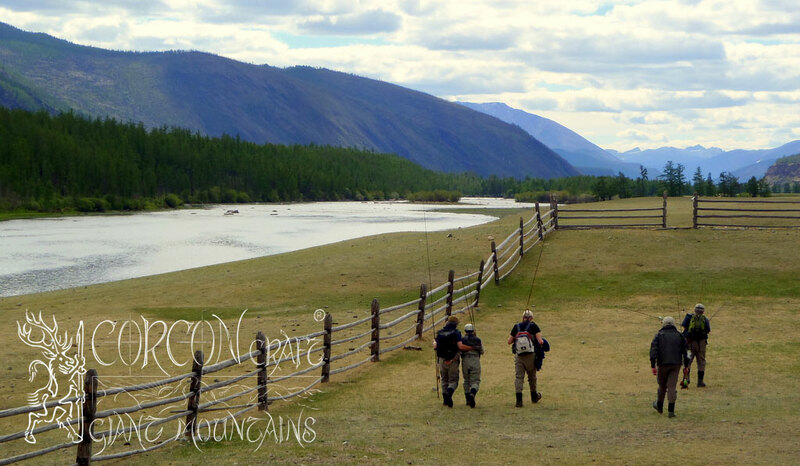 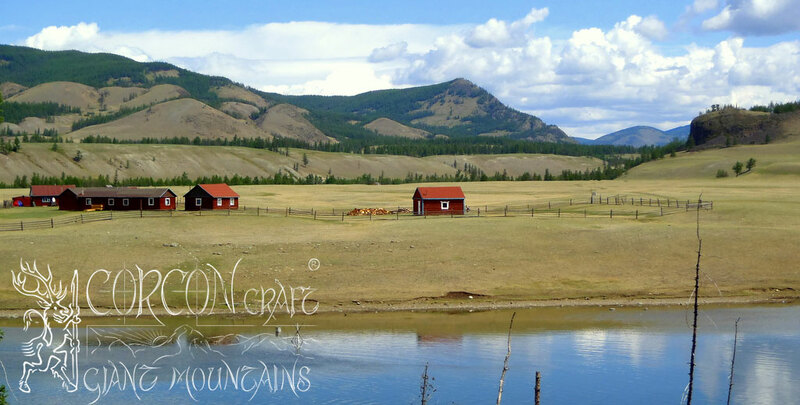 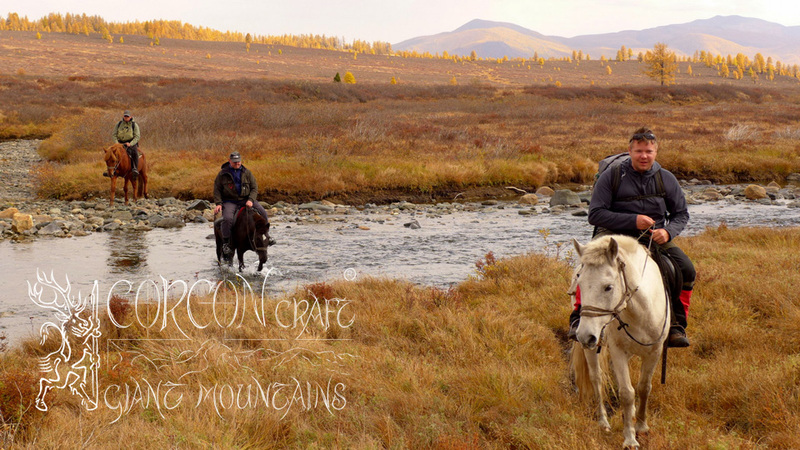 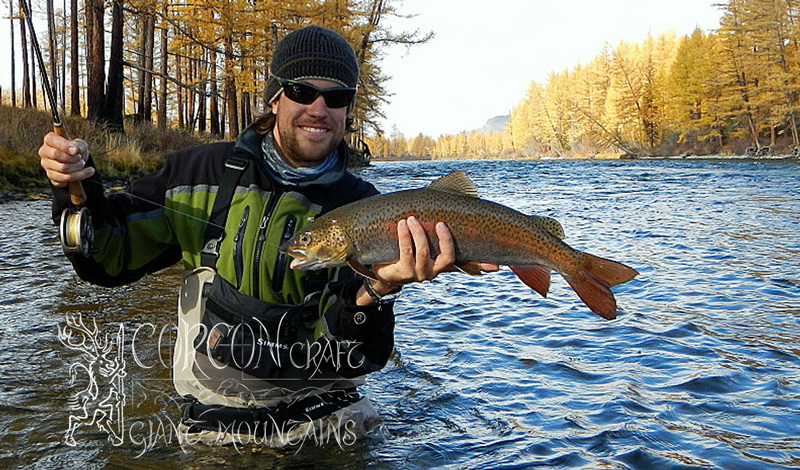 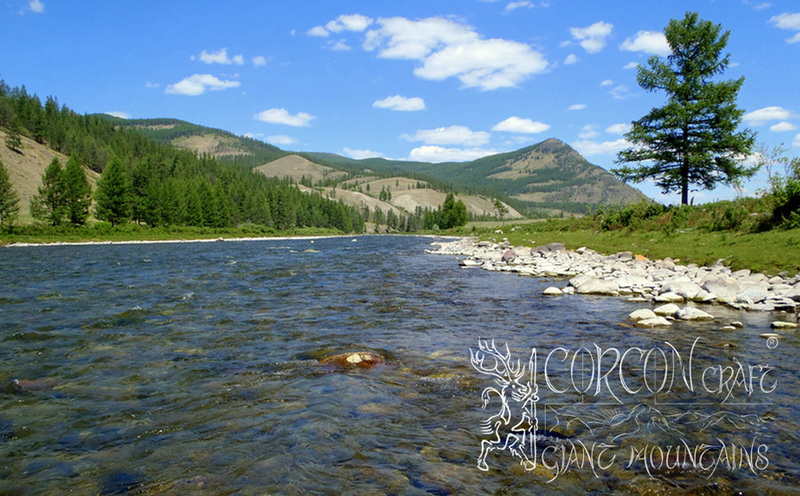 Two days on the horse trail with fishing and camping along the river will be leading us to remote fishing grounds, experienced yet only by a very small handful of tough outdoorsmen. 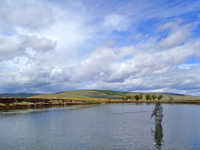 Wilderness fishing at a pure mountain lake full of Lenok Trout and young Taimen will be the highlight of this Taimen expedition, where we will set up our fishing encampment in the tranquility of the Shaman Lake for a few days. 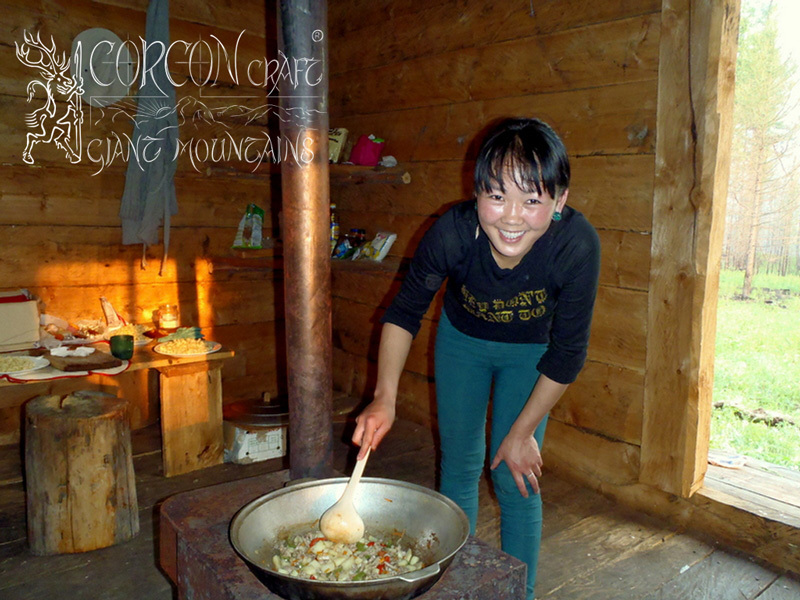 We may meet the nomadic people of the Tsaatan tribe, free roaming reindeer herders, who are camping at the mountain lake in spring time. 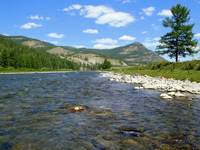 Floating down the Tengis River, we will be fishing and camping at the most picturesque of Taimen pools, which must have been created by Burkhan, the god of the Eternal Blue Sky himself, just to please the genuine sportsman. 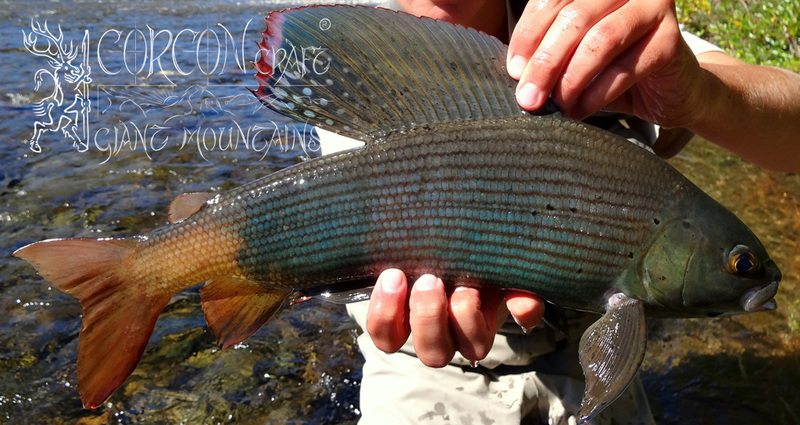 The pure Tengis River with his colorful fish and large Taimen will be leading us back to our base camp Tengis, where the journey began. 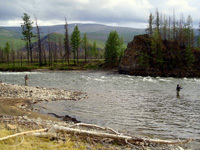 Main lodge and Taimen camp at the confluence of the Taimen rivers Shishkid and Tengis. 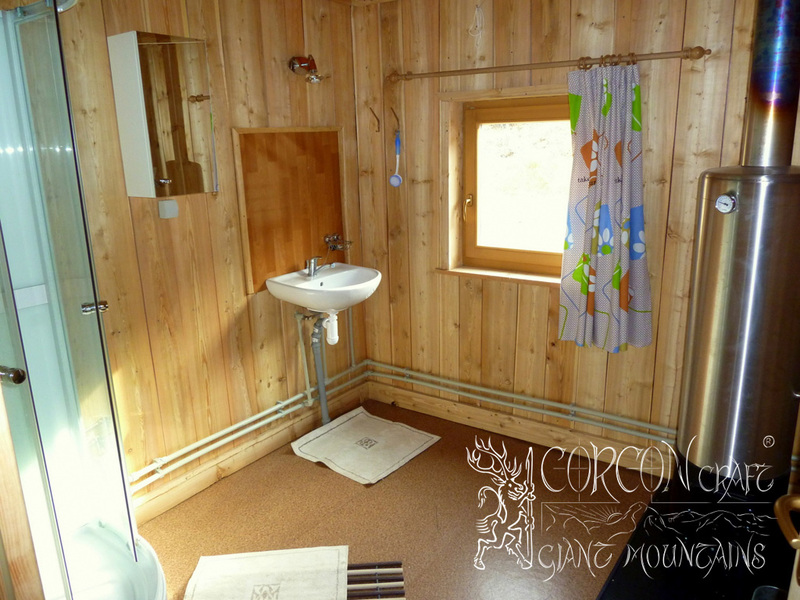 Comfortable log-cabin camp with complete catering and independent power supply. 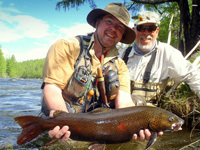 Tour 14 days with 12 days of pure sport-fishing, full board of fresh organic meals and traditional dishes. 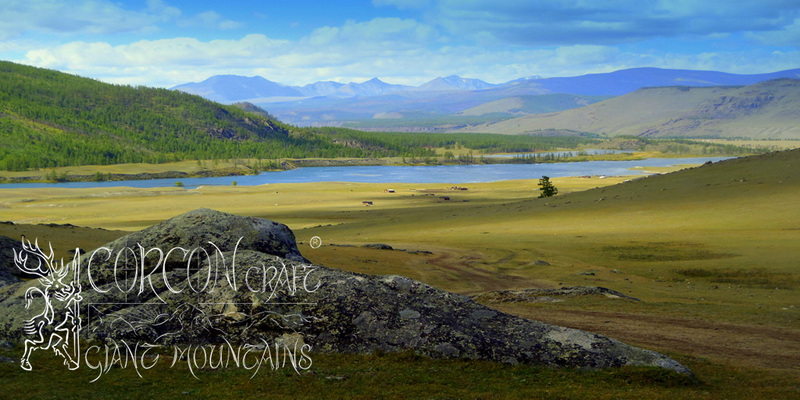 National Park of 1st order in the Mongolian Eastern Sayan Mountains. 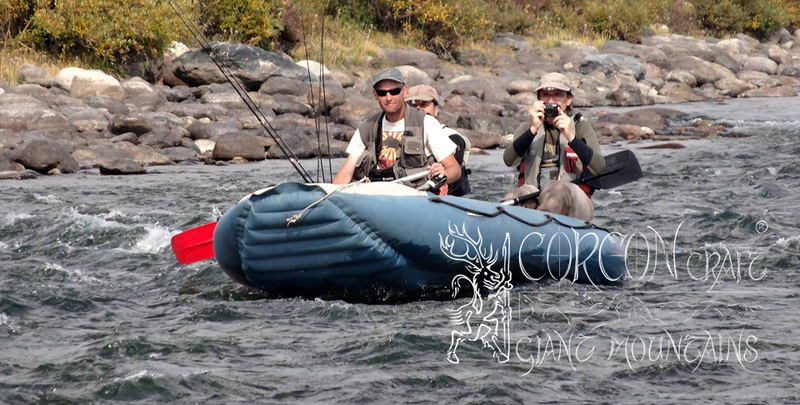 Roughly 250 miles from the provincial town of Moron, and 15 miles upstream of our wilderness camp Khanagai. 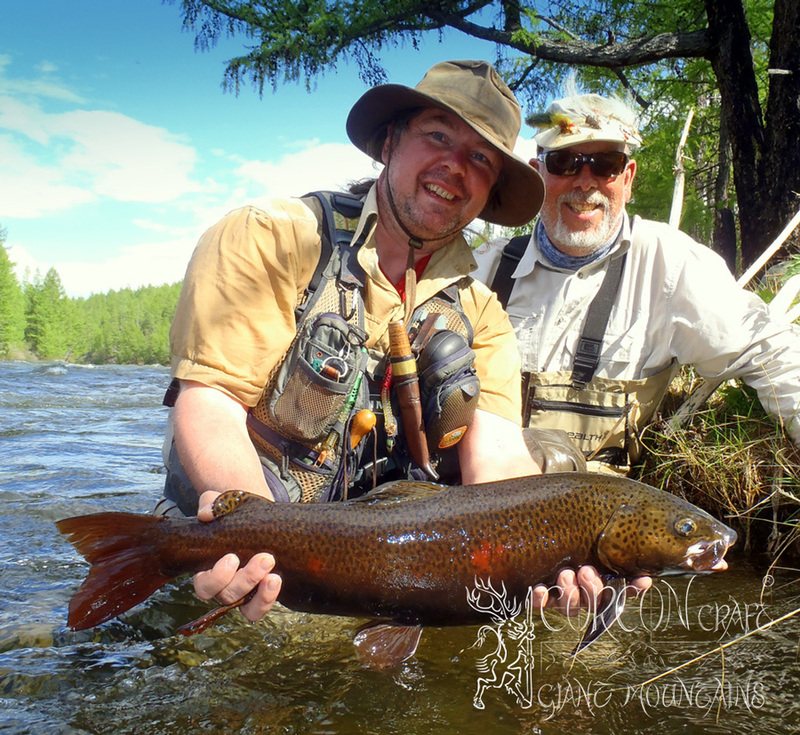 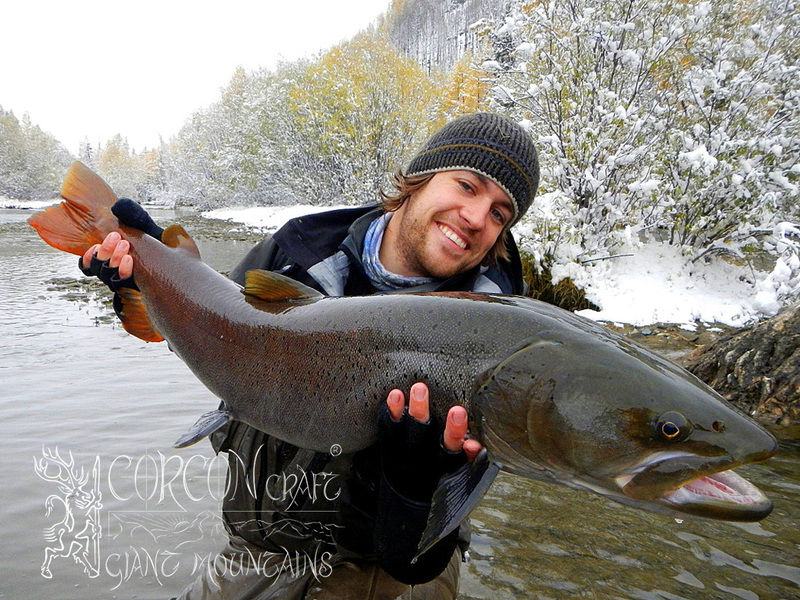 Exclusive sport fishing with special permits from the government, strictly limited Taimen licenses. 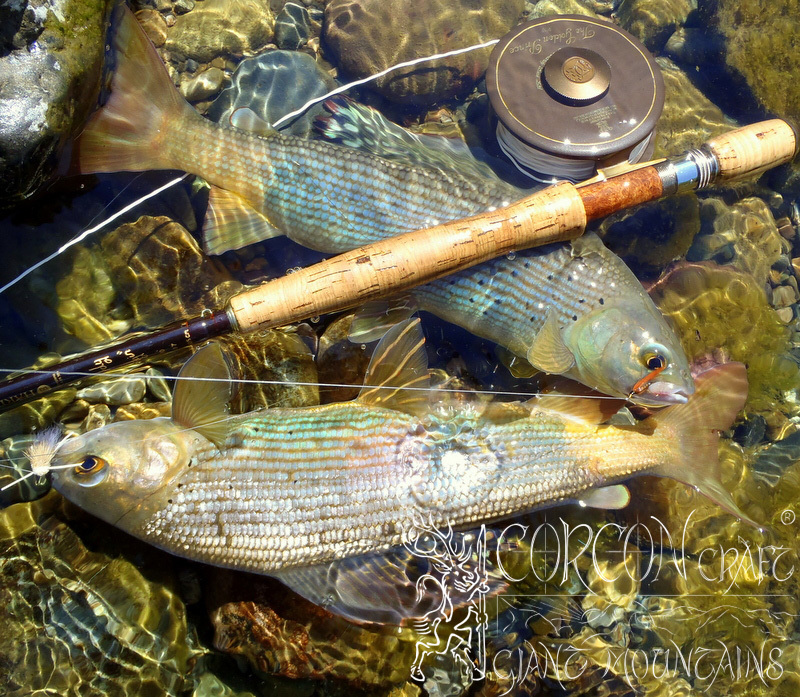 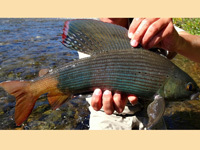 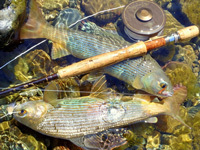 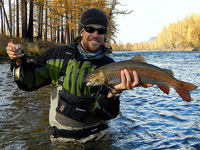 Fly-fishing for strong Hucho Taimen, prime Lenok Trout, and colorful Yellowtail Grayling. 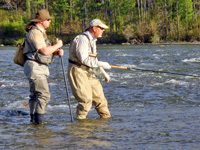 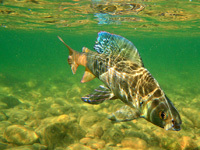 More than 70 miles of various river stretches for groups of no more than 6 anglers. 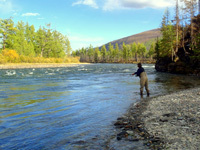 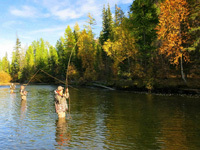 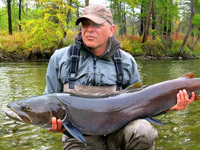 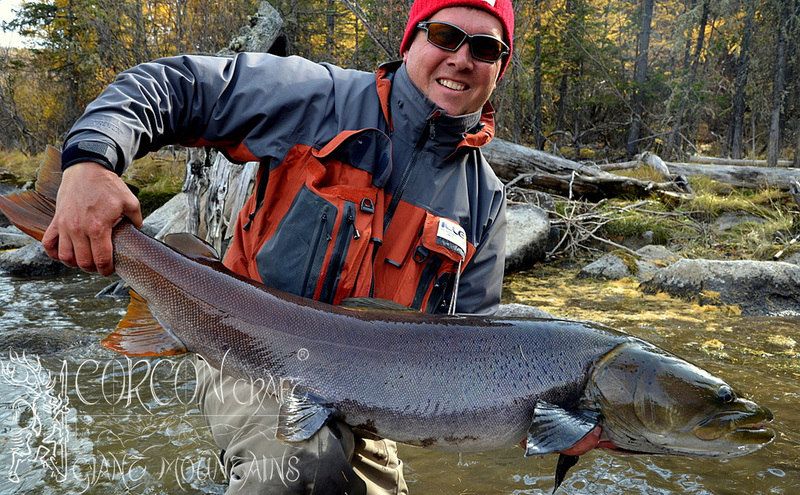 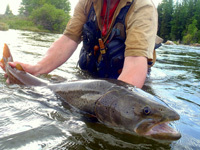 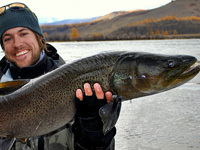 3 legendary Taimen rivers Shishkid, Tengis and Shargin to be explored by day trips and extended fishing tours. 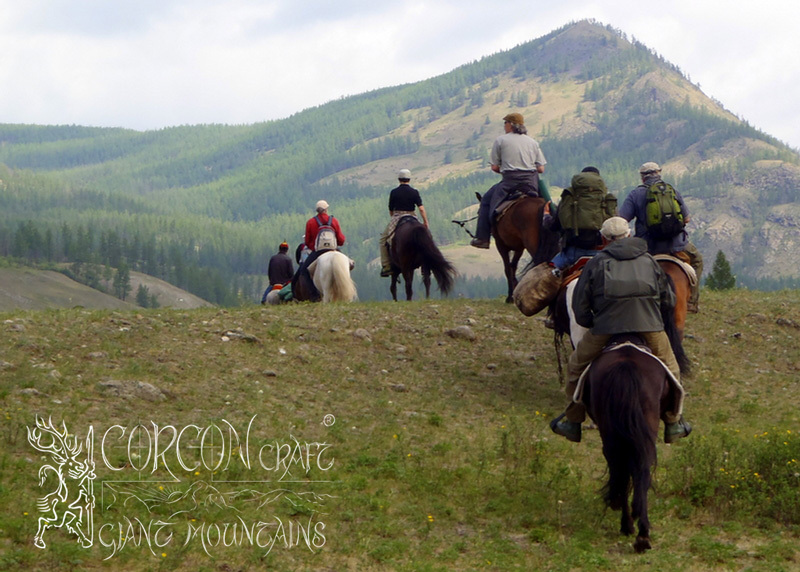 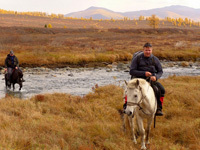 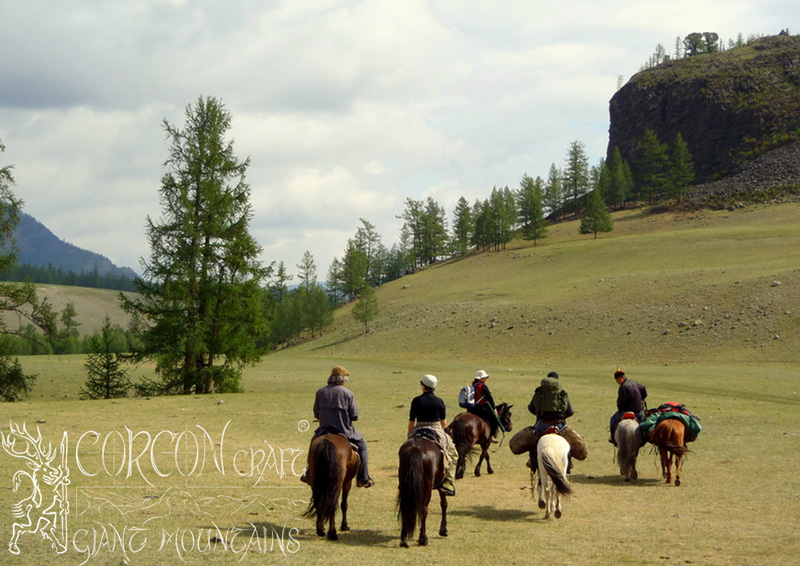 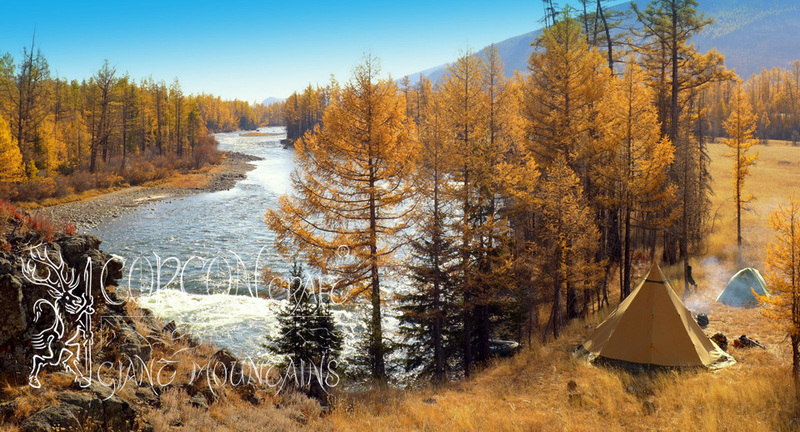 Camping gear includes off-road vehicle, horses, rafts, tents, and native guides and horsemen. 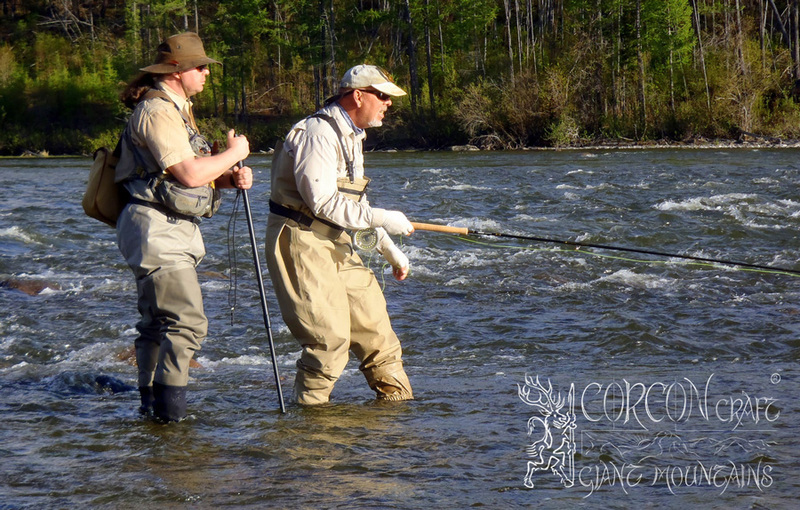 Suitable for both, fly-fishermen and spin-fishing sportsmen alike. 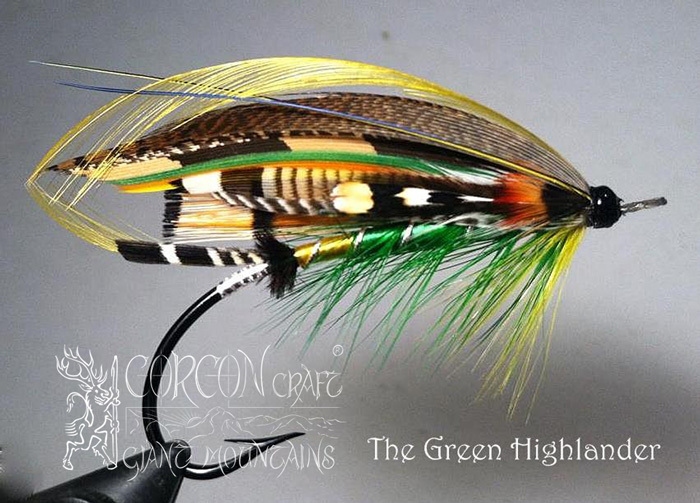 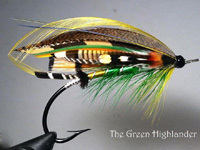 A small fine collection of custom fly-patterns is included for each first-time fishing guest. 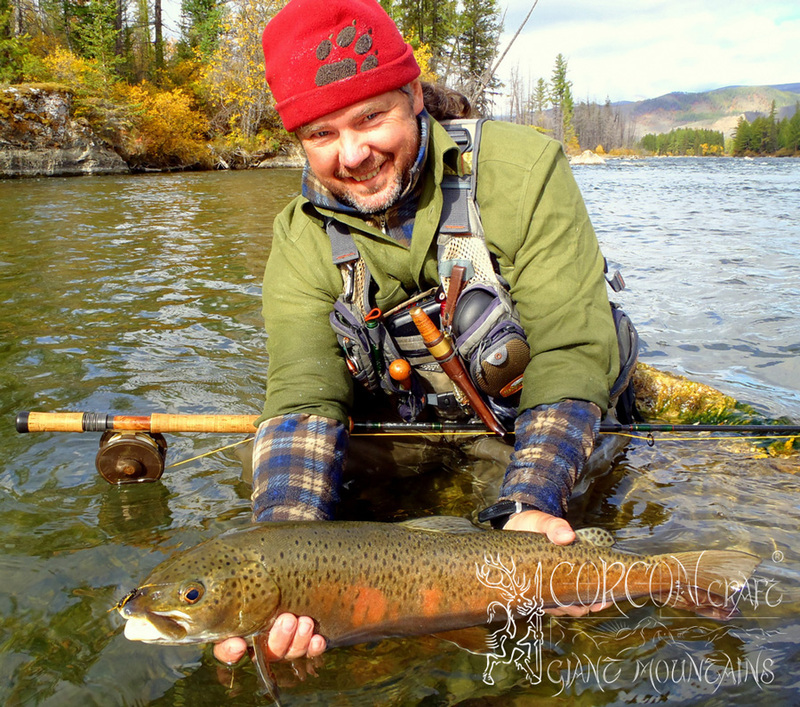 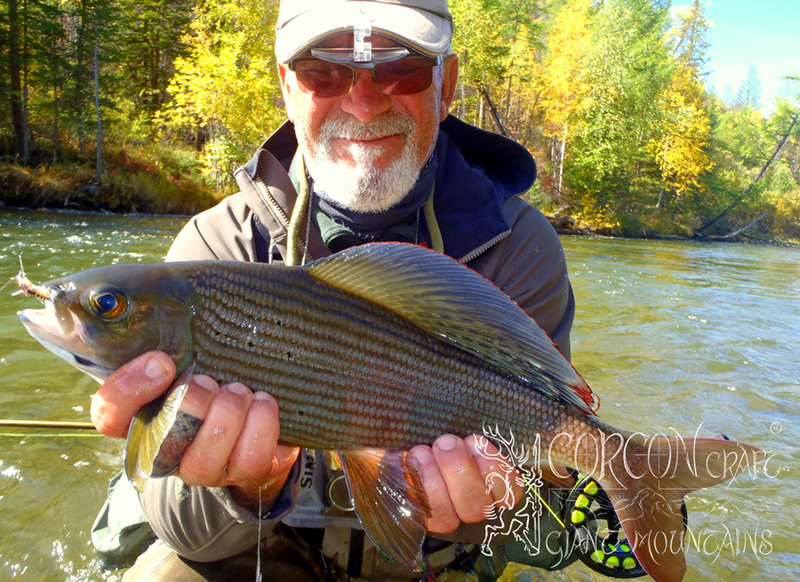 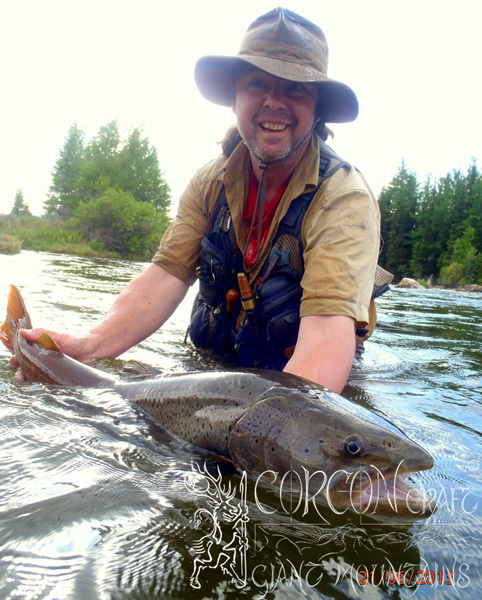 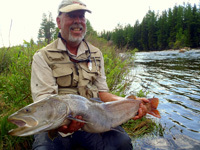 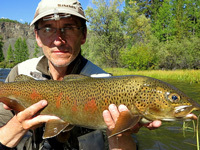 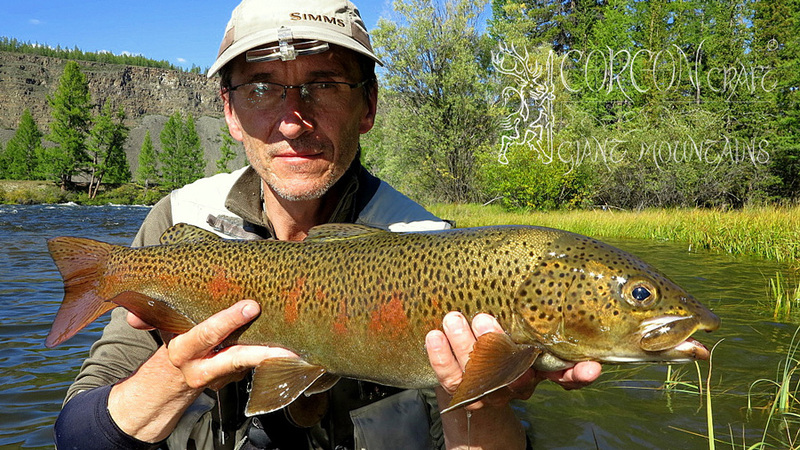 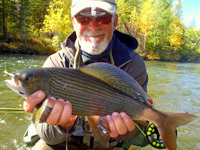 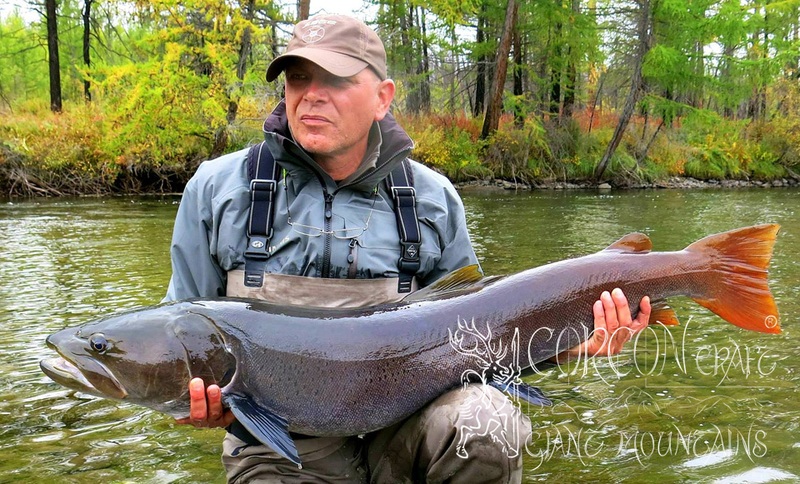 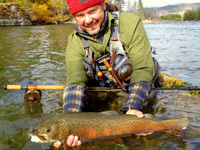 Each Taimen tour is guided by one of our European river guides and fly fishing masters. 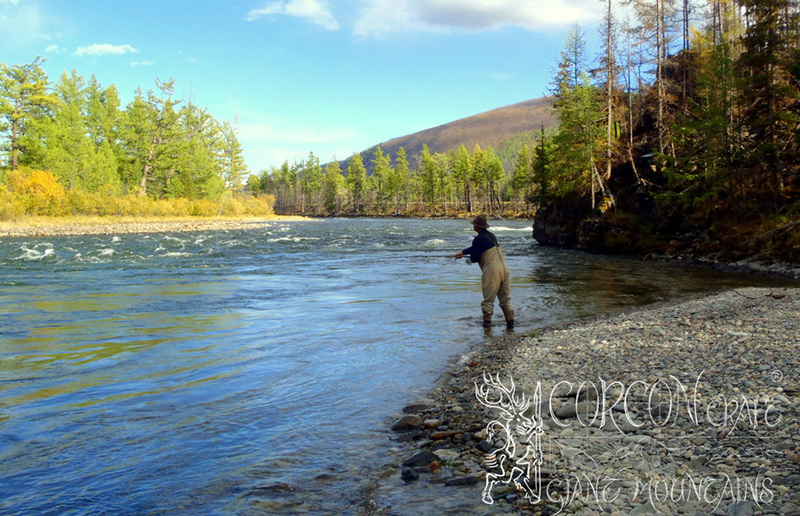 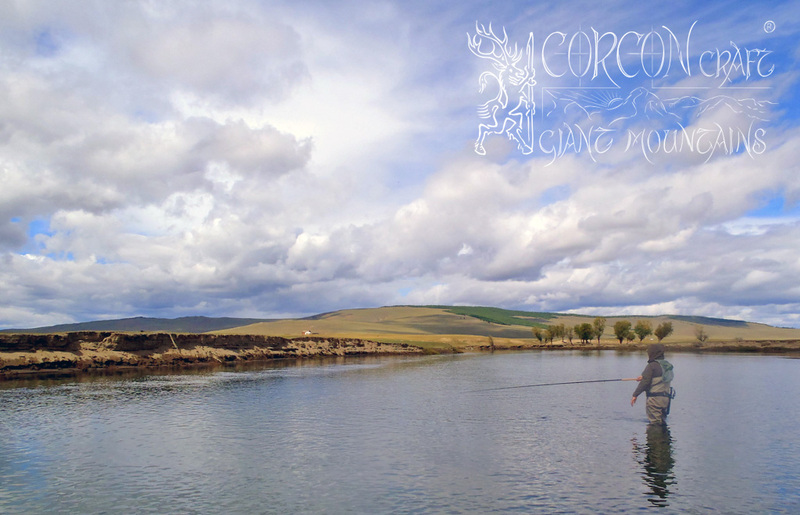 Recommended tour dates for fly-fishing are in the spring season (massive hatches of large insects), and in early autumn, when the rivers are low. 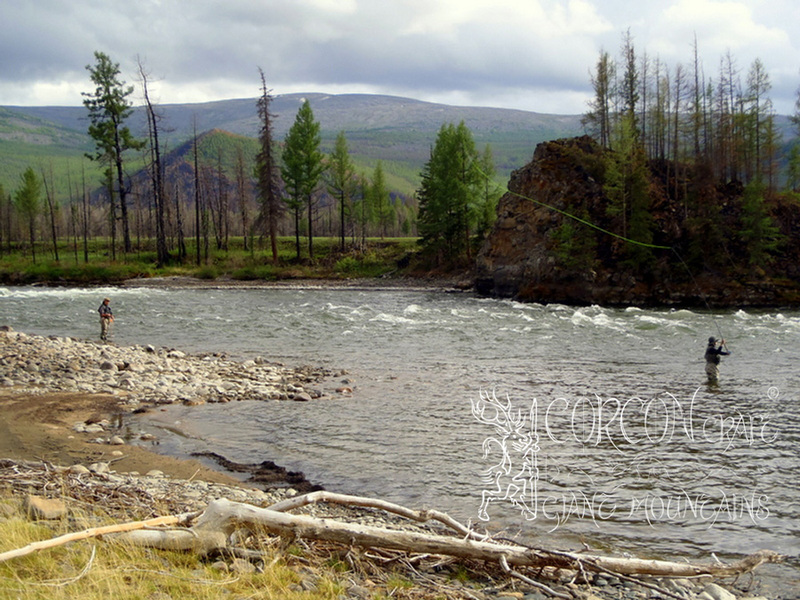 Extraordinary and many-sided Taimen rivers with the precious Yellowtail Grayling and with the largest Lenok Trout in the whole of northern Mongolia.